Aims: Plankton abundance and diversity are governed by certain aquatic environmental factors which collectively determine the health of the aquatic ecosystem. 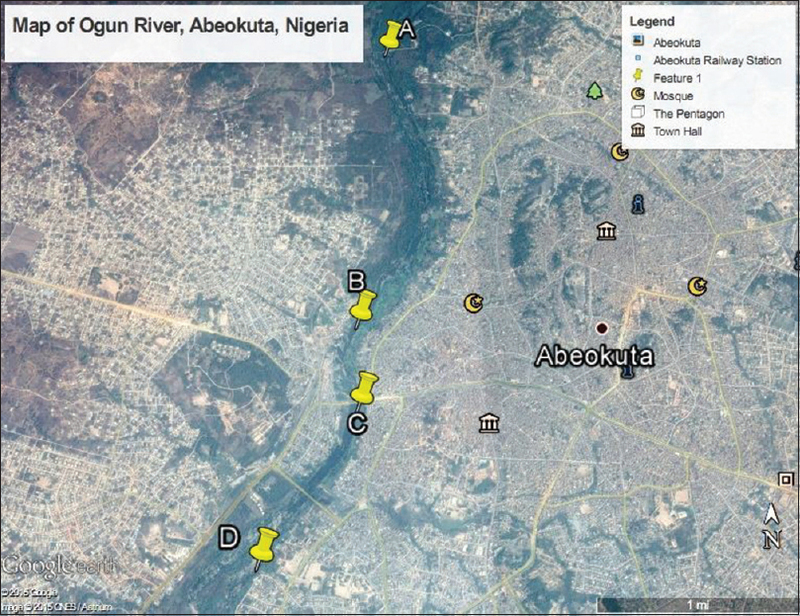 This study was aimed at investigating the water quality of lower Ogun River, Abeokuta, in relation to plankton abundance and diversity. Materials and Methods: The dataset consists of physicochemical and plankton data collected for 7 months within the period of December 2011 and June 2012 in four stations. Spatial correlations were determined between physicochemical parameters, plankton abundance, and diversity. Physicochemical parameters that exhibited strong correlation with plankton abundance and diversity were used in the calculation of a water quality index (WQI) for the protection of aquatic life. Results: Results showed highly significant correlations (P ≤ 0.05) between plankton abundance, diversity, and the physicochemical parameters monitored during the study period excluding alkalinity and phosphates. The Canadian Council of Ministers of the Environment WQI showed that the river water quality in all the sampled stations (A, 63; B, 63; C, 56; and D, 64) was marginal in classification. Conclusion: It was concluded that River Ogun is polluted beyond doubt. Hence, corrective measures should be put in place so as to prevent total ecological collapse. Aims: This study aimed to evaluate some relevant serum biochemical and hematological changes in concentration level involved firefighters in comparison to normal controls. Materials and Methods: This study involved two groups of male firefighters to participate in the study. The first group included 50 firefighters from Dammam while the second group included 50 firefighters from Khobar. An additional control group of 50 male nonfirefighters from both cities was included in the study. Blood samples were collected from all participants and investigated for some relevant biochemical, hematological differences and blood heavy metals between the three studied groups. 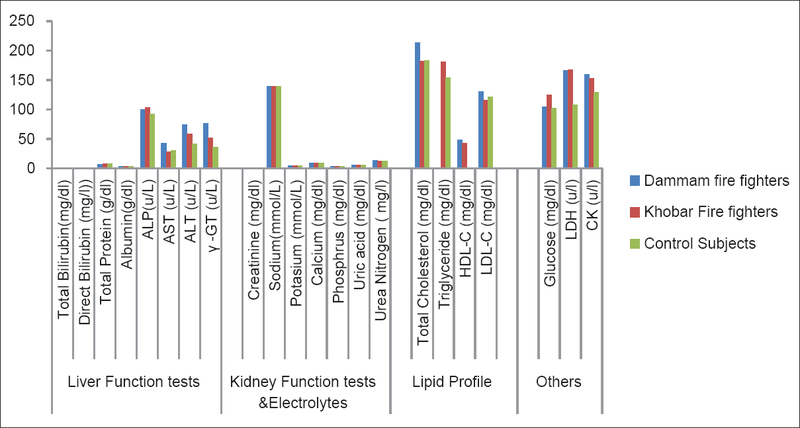 Results: The results obtained showed that there were statistically significant differences in liver function, serum lipid profile, creatine kinase, lactate dehydrogenase, iron and ferritin, and blood picture in firefighters as compared with normal control group, while there were no statistically significant differences in the levels of blood heavy metals in firefighters as compared to normal controls. These results indicate that fire smoke mainly affects serum biochemical and hematological parameters but does not affect serum heavy metals levels. Conclusion: Such results might point out to the need for more health protective and prophylactic measures to try to avoid such hazardous health effects that might endanger firefighters under their highly drastic working conditions, and firefighters must be under continuous medical follow-up through a standard timetabled medical laboratory investigations to allow for the early detection of any biochemical or hematological changes. Aims: Fatigue can be defined in various conditions. In literature it has been defined and explored by various researches through different aspects. This study was conducted to establish the relationship between the duration of work exposure and feeling of subjective fatigue. Materials and Methods: Twenty-one jewelry manufacturing workers as study group and 27 students as control group participated with their signed informed consent. 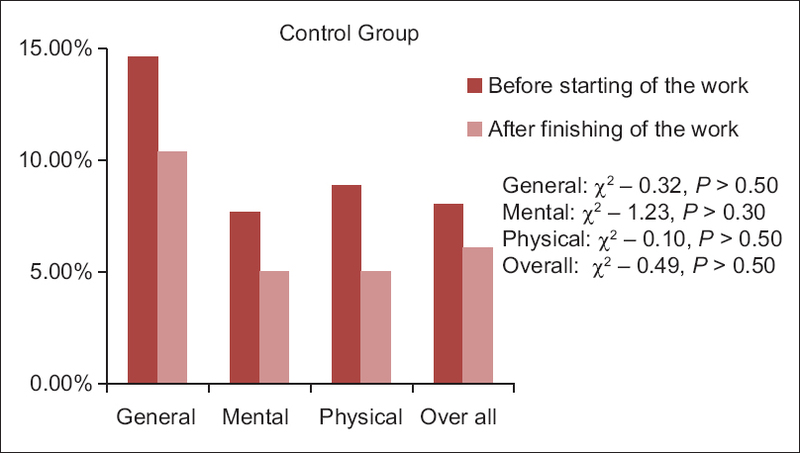 The daily diary method and feeling of subjective fatigue evaluation questionnaire were used as a tool in this study. Three categories of feeling of subjective fatigue were considered in this study. The study was conducted mainly in the middle of the week. The data regarding feeling of subjective fatigue were collected before starting of work and after completion of the work day. Results: The results showed that The time spent on the job by the workers engaged in jewelry manufacturing was 670 min and were in four slots with the longest work period being 240 min. Sleeping time was found to be around 480 min. Conclusion: The study revealed that all three dimensions (general, mental, and physical) were affected by the whole day work exposure. Among three types of fatigues, general fatigue was observed at the beginning and end of the work shift.